Here lie the musings of Amna Usman Chaudhry. Balancing on the fine line between Realism and Surrealism. I have come to the conclusion that one just can't watch television news anymore without being shocked. Case point what I saw today. I was sitting bored on the sofa, flipping through news channels when I stopped to linger on Geo News. They had big flashing signs coming up every few minutes about some breaking news. Intrigued, I watched on. What followed has left me feeling appalled and indignant. I have tried to google the story so I could share it with my friends, but I guess it is too recent, so haven't found much online. The Geo clip is not available on youtube yet either. Hence I decided to write this not only to vent out the feelings of shock and horror conjured up after watching this clip but also to use it as a platform to share the news with others. 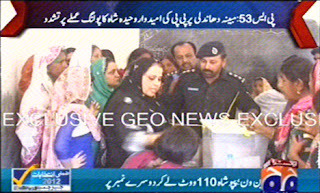 A Pakistan People's Party (PPP) candidate for the Sindh Assembly seat beat innocent women at the polling station. The candidate's name is Wahida Shah and what makes the video so shocking is the fact that she suddenly lashes out and hits the women in the polling station! Not only does she hit one, but there are clips of her hitting multiple women who were just standing there, just brutally slapping them for no apparent reason. From the video clip, she first talks furiously to the security man near the ballots, and then without any warning turns out and slaps the poor lady sitting innocently nearby. The woman starts to cry. Shah is then also seen lashing out at other women, all of whom seem poor and helpless and did nothing to incite her anger. The fact that Shah has lost her temper, is very fat compared to the thinner women around and is putting all her energy in her slaps and punches makes her look highly scary and honestly reduces respect any one must have had for her to below zero. Shah is apparently a powerful woman according to the locals, since when the cameraman asks the women victimized, between their sobs they say nothing happened. It was just a misunderstanding, Wahida Shah did not do anything. The poor women were too terrified to speak the truth. Geo goes on to highlight how the poor woman must have thought that Wahida Shah was their one hope, a representative who can bring their plight and highlight their oppression. Little did they know that the very person who symbolized a light in the tunnel would make the journey all the more terrifying by showcasing her true colors as a tyrant. The poor women who were beaten were innocent government employees, many of them primary school teachers. They did not deserve to have someone lash out at them so rudely. Not only has their respect been compromised, they have also been traumatized mentally, emotionally and physically. Even if they were the employees of this tyrant, no one deserves such treatment. The government should take this into view and Wahida Shah should not be allowed to run for office again. An example needs to be set. People deserve to be treated equally with respect, regardless of power, creed, race and money. My mum told me about this incident yesterday. What was even more saddening was the fact the police were standing there twiddling there thumbs. "People deserve to be treated equally with respect, regardless of power, creed, race and money." Nicely said. Thanks for your feedback Nas. I finally managed to find a video of the incident, I am still in shock watching it. Appalling. Musings of Amna Khalid. Travel theme. Theme images by ideabug. Powered by Blogger.